Thank you for visiting St. Paul’s website. We hope the site provides the information you are looking for, and we look forward to seeing you at St. Paul’s. You may park in Municipal Lot #1 across First Avenue from the church or in the side lot to the left of the church. 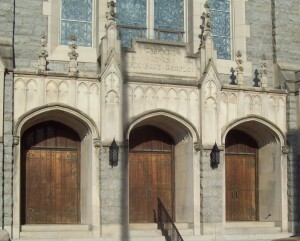 The easiest way to the sanctuary is by entering through one of the three doors on the front of the church. There is also a ramp located at the front of the church. You may also enter the church from the side parking lot at the rear of the church. See our Worship Page for summer worship times. 9:00-worship in the sanctuary Nursery care is provided during this service by volunteers who have the required clearances. See our Worship Page for more information. Copyright © 2019 St. Paul’s United Methodist Church.